Lions and tigers and… cheetahs and cougars and panthers and an elephant, oh my. Giant cats of the world, while adorable, are typically regarded as wild, dangerous animals and are treated as such. Unless you’re Noel Marshall, Tippi Hedren, daughter Melanie Griffith, or one of the two sons John and Jerry Marshall, in which case you’d be raising countless giant cats from cute baby cubs until one day you’d amassed more than 130 giant cats, and you then wonder, what do I do with all these giant, untrained cats? You would cast them in a movie with yourselves that would take the better part of ten years to make, cost you a marriage, alienation from your children and a hospital bill for the maiming of over 70 people, of course. Noel Marshall’s passion project Roar, is an exhilarating, nerve wracking, head shaking (head scratching? ), and somewhat cute, in that oh-look giant kitties, sort of way, good time. There’s a level of hubris matched with lunacy involved with making a movie while over 110 lions and tigers and cougars, etc. are running around you, batting at, gnawing, swatting, swimming and chasing you. The story, what little there is of one, involves animal researcher Hank (Noel Marshall), who’s living in an isolated house with all these wild giant cats, doing research, when the rest of his family, played by themselves, arrive via a plane to join him. Inner cat melodrama ensues and Hank has to leave the house while his family unknowingly arrives to a house overrun by Hank’s pets. Insanity ensues as the family is played with like stuffed kitty toys, while they attempt to flee and hide from the feline onslaught. While not ravenous and blood-thirsty, the relatively untrained animals cohabitate with the humans by playing with, and asserting dominance over them. A tiger jumping on someone for attention could mean a series of stitches. 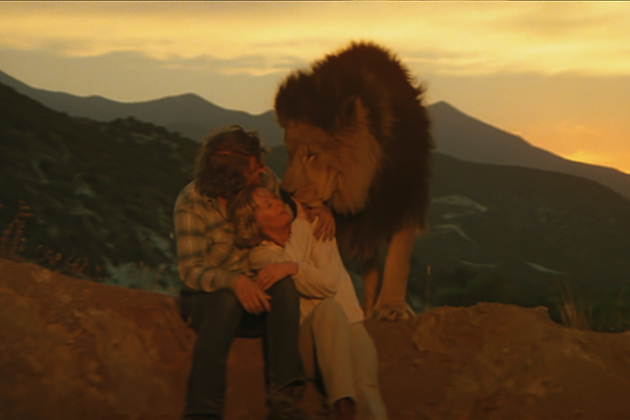 Director of photography Jan de Bont, who would go on to direct films like Speed, and Twister, was scalped by a lion when it bite his head during filming, requiring over 200 stitches. de Bont returned to set to finish filming the movie. Somewhere thrown into this amusement park house of horrors of large, playful kitties, there are two poachers looking to kill Hank’s cats, and sibling rivalry between the king of the cats, Robbie, and his brother Togar, a blood-soaked ravaging lion who plays the Scar to Robbie’s Mufasa. However, most of the movie is comprised of Noel Marshall running around screaming with his hands thrown in the air to attempt to intimidate the giant cats and keep them from killing each other, and himself and family. With flailing arms, unkempt beard and wild hair, Marshall looks like a cross between Grizzly Adams and one of the Fabulous Furry Freak Brothers, as he screams insistently, chasing after lions and tigers head first. As entertaining as it all is, there’s clearly lingering questions of, how was no one actually killed? and why weren’t these people locked up? As if in response to the last question Tippi Hedren has since gone on to create the Shambala wild life preserve, where giant cats are allowed to live in natural environments, separated from the people who come to visit, so as to respect the boundaries between tamed and untamed life. Watching Roar certainly creates a high for the viewer, but it also serves as a documented examination of the dangers of hubris in the face of nature. Ultimately though, just sit back and be prepared to hang your jaw for a while.